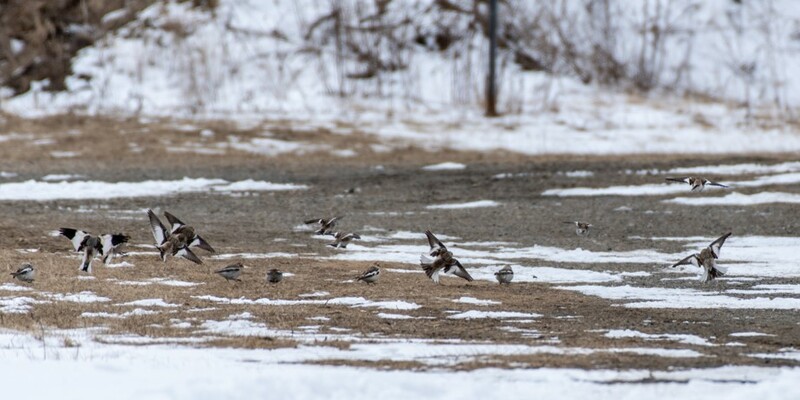 Posted on February 22, 2019 by Jude G.
Susan Yurkus and I sallied forth from Joppa Flats Education Center with 20 or so game Wednesday Morning Birders. Skies were overcast with a hint of sun here and there; temps were in the mid to upper 20s; and, most importantly, winds were light and variable. How many times of late have we had such benign conditions? Pretty nice! Our first stop was Salisbury Beach State Reservation. Along the entry road out in the marsh, sharp-eyed (dare I say, eagle-eyed?) Kim spotted a large juvenile Bald Eagle perched on an upright of some sort. By its size, this was probably a female (remember, female Bald Eagles are about 25 percent larger than males) and the white triangle on its back made it a 2- to 3-year old. Then, lo and behold, a binocular field’s width to the right, a pair of adult Bald Eagles were perched side by side on a nesting platform. That was a nice start to the morning! From the boat ramp, we had excellent views of many sea ducks. There were a number of White-winged Scoters with great comparisons between adult and juvenile drakes. The juvs were evolving into their colorful adult bills, but had not yet attained the white commas through and behind their eyes. 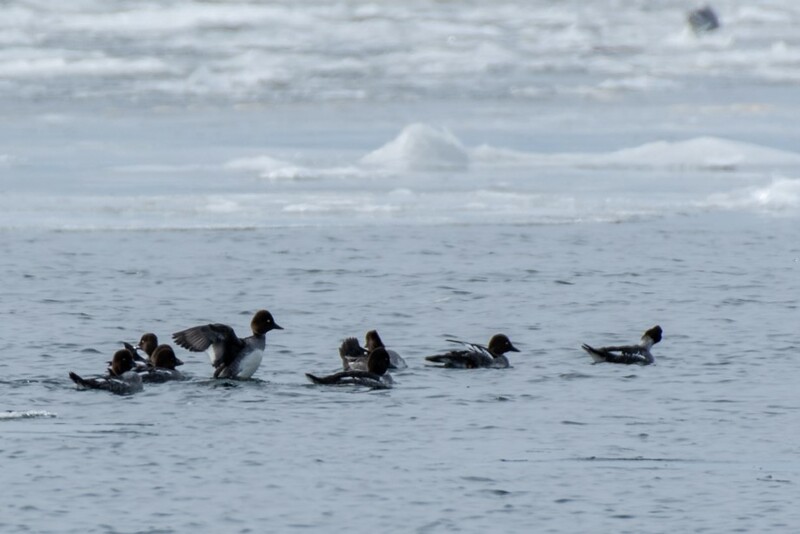 Several groups of 10 to 20 Common Goldeneyes could be seen along with small groups of Long-tailed Ducks. Many of our group commented on how these looks were the best that they had ever had, especially of the Long-tails. With the somewhat windless conditions, we spent a long time watching these duckies, enjoying the views and courtship behavior going on among a major share of them. And, commonly seen in and along the edges of the marsh were many American Black Ducks and Canada Geese. We were unable to pick up Brant that had been seen earlier by a fellow birder. A few Red-breasted Mergansers and Buffleheads were also seen along with a lone hen Black Scoter. From parking lot #1, in the river channel were more White-winged Scoters and several rafts of Common Eiders. Three Common Loons were fishing there, too, and a few more Common Goldeneyes and Red-breasted Mergansers were seen. Another Harp Seal was on the beach, being protected by a warden. Several Turkey Vultures were lilting above us as we departed the parking lot. 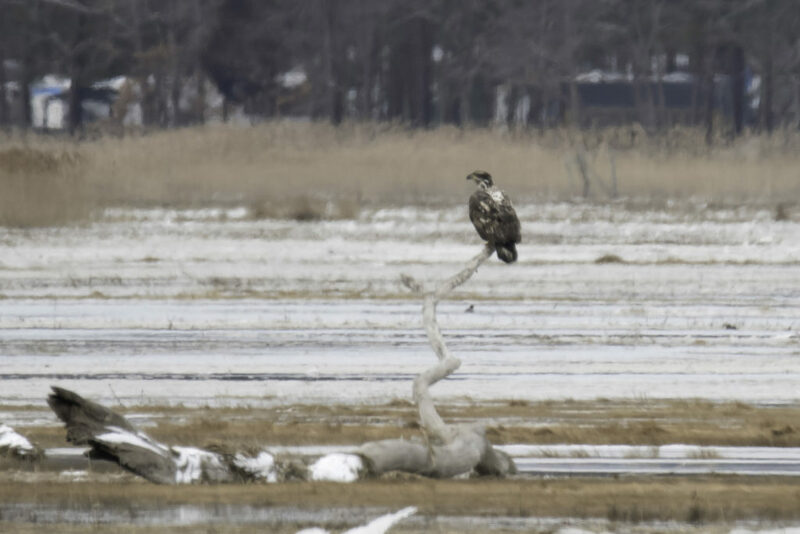 On the way out of the reservation, we had another look at the juvenile Bald Eagle and picked up two Red-tailed Hawks perched in trees looking into the marsh as these “perch hunters” do with their phenomenal eyesight. We spied another Red-tail en route to Plum Island, this one on a nesting platform along Ferry Road. Approaching The Warden’s, I saw a flock of small birds fly overhead and toward The Warden’s. 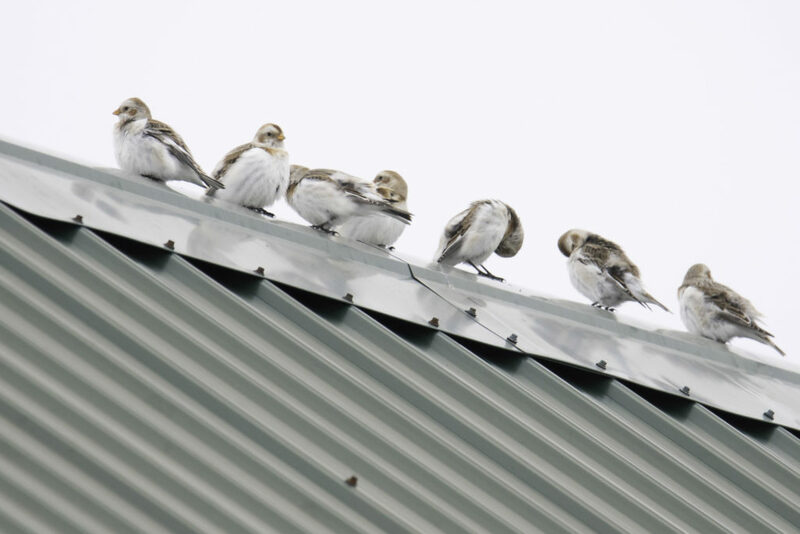 Turning into the parking lot, we found 17 Snow Buntings perched on the roof ridge of one of the maintenance buildings. They afforded us outstanding looks before flying down to the ground to feed on seeds near the pines. The photographers among us were able to approach reasonably close for some photos. 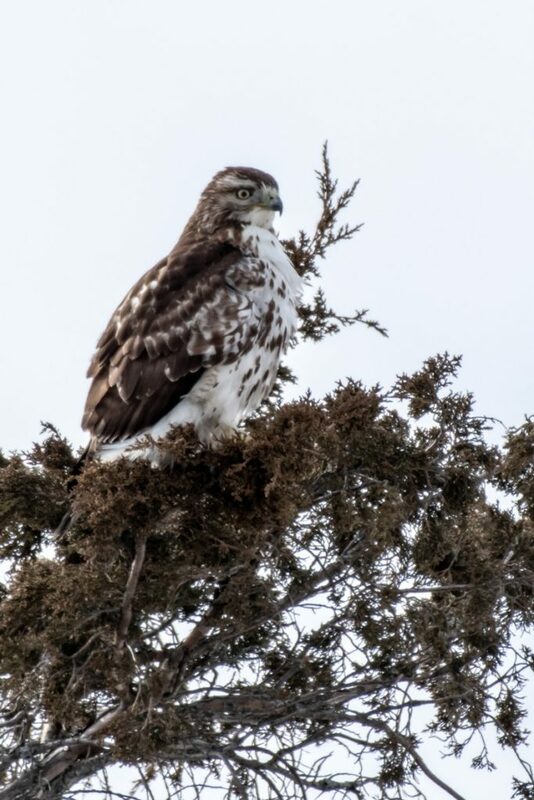 While there, a dark-morph Rough-legged Hawk was spotted by one of us sitting atop the “lollipop” cedar on the North Pool dike. Through a spotting scope, its relatively small head and bill could be readily seen. In the same direction, “eagle-eyed” Kim came up with a harrier that had perched low down in the shrubs just this side of the dike. This beautiful adult female Northern Harrier soon took flight and gave us a showy flyby at eye level through and behind the pines. What a gorgeous bird! Getting into overtime, we headed back to Joppa. Our list was not overwhelming, but the quality of the birds and mammals (!) seen was satisfying . . . .
David Moon and I hope to see you next week back at Joppa Flats Education Center ready for another edition of Wednesday Morning Birding. Y’all come!! Mallard (4) – boat ramp. 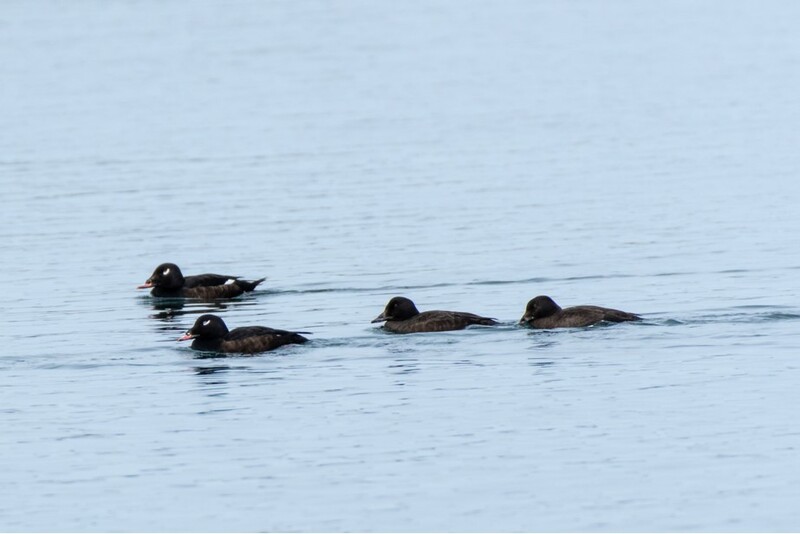 Black Scoter (1) – hen. Bald Eagle (3) – 2 ads, 1 2-3-yr old. Mallard (~ 6) – hay marsh. Bufflehead (4) – from The Warden’s (PI River). 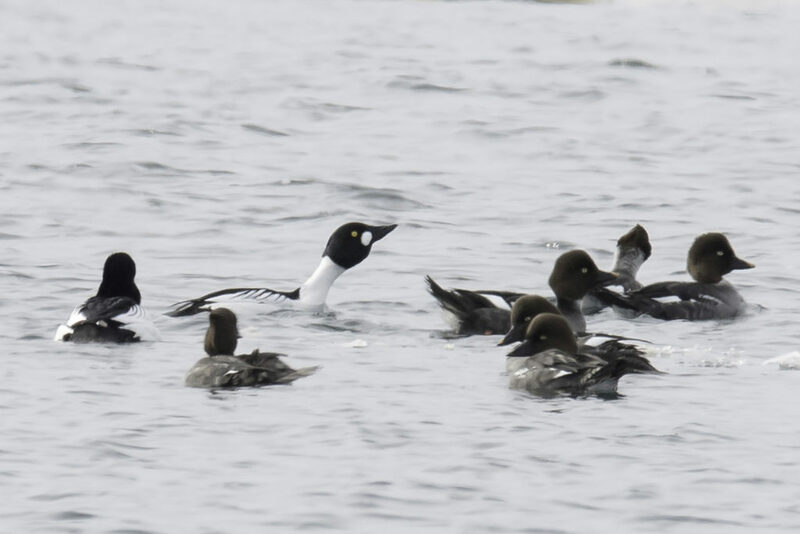 Common Goldeneye (1) – from The Warden’s (PI River). 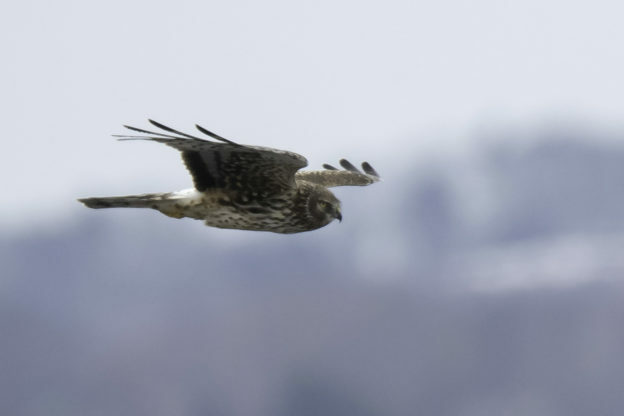 Northern Harrier (1) – ad female; The Warden’s. 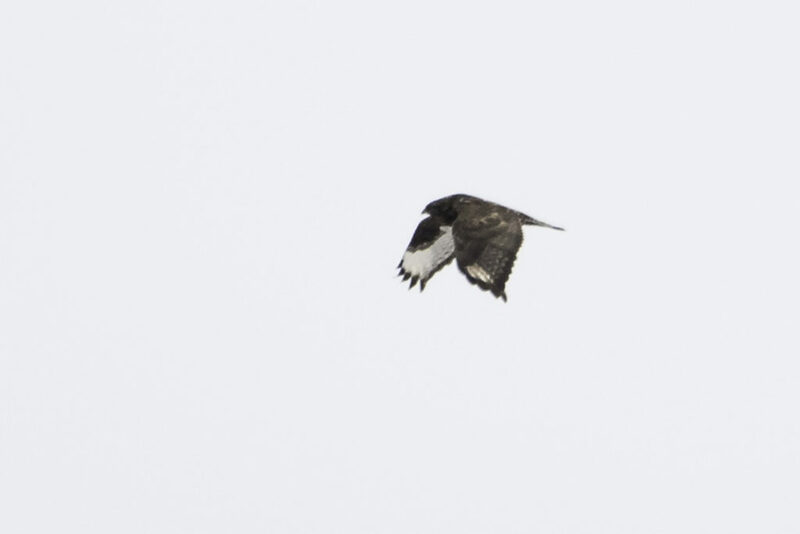 Rough-legged Hawk (1) – dark morph atop N. Pool dike “lollipop” cedar. Great Black-backed Gull (1) – hay marsh. Rock Pigeon (~ 25) – on lines n. refuge gate. American Robin (3) – S-curves. 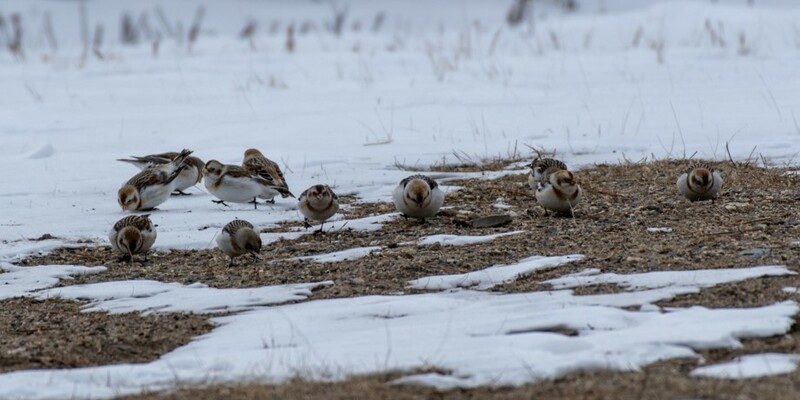 Snow Bunting (17) – The Warden’s. Coyote (2) – in astronomical high tide, mid-marsh, sw Main Panne. This entry was posted in Birding on February 22, 2019 by Jude G..